Afternoon everyone, its a great snowy day here. And I’m in my element!! 🙂 Through out most the year on colder days (get them a lot in scotland) I like to wear scarves, whether I tie them round my bag or up in my hair as a head band. I love the fact that they can be so versatile in the way you can wear them. During the colder days I wrap up in my big chunky knit scarf, but that’s near the end of it’s time!! I do have a slight obsession with the handy little things. 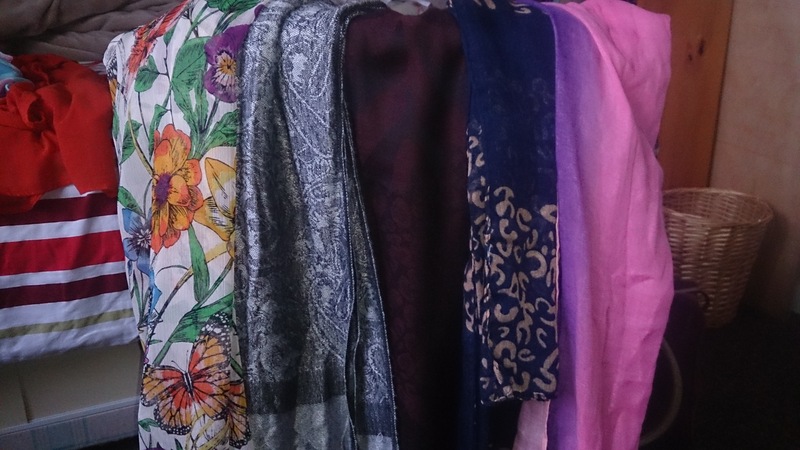 These are some of my favourite scarves. The three in the middle get worn a lot at the moment because they are all little thinker and longer too. Not just that they go with loads of my clothes and jackets. The best thing about these is that they aren’t too thick, where the feeling choking and heavy around the neck and shoulders. The other two scarves are mainly used in summer and tied round a bag or wrapped round my belt. I’ve got another 10 scarves floating around the house and I’m looking forward to building up on more. My favourite one outta these 5 is a battle between the black and grey one from the Edinburgh Museum and the blue one from Pink Strings. Actually. I am most definietly like you! I love scarves. They are the essential accessory for any season.